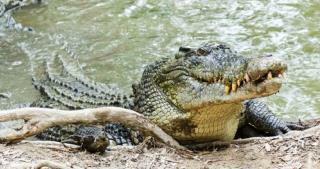 (Newser) – When a man went to the side of his boat to empty a bucket at Australia's Kakadu National Park on Saturday, he was attacked by what police say was a 15.5-foot-long crocodile and vanished, his wife, son, and daughter-in-law unable to save him. Now, the 62-year-old's remains may have been found inside a crocodile. Two of the reptiles were shot yesterday about a mile from the site of the encounter, the AAP reports via the Sydney Morning Herald. "A quantity of human remains was recovered" from one, say police. They have yet to be IDed. The guy must have looked like a hot dog to a fat man on a diet. Put another shrimp on the barby ,matilda, I'm ready to eat, said Mr. Crocodile.